The Real School Unschooling Cooperative (www.therealschoolhouston.org) will be offering a 5 part series focusing on the work of education icon John Taylor Gatto (www.johntaylorgatto.com). The series will use the recently released 5 hour DVD, “The Ultimate History Lesson: A Weekend with John Taylor Gatto” in an extended dialog about John’s work and its importance to The Real School and to all committed to alternative educational models. The series will take place from 1-4pm on 5 consecutive Sundays; 7/29, 8/5, 8/12, 8/19 and 8/26 at The Real School. The address is 2805 Wichita, Houston 77004. This is the Alliance for Cooperative Transformation property (www.actnowhouston.com) which houses The Real School. People of all ages are welcome to attend. Folks may, of course, come to some or all of the sessions. 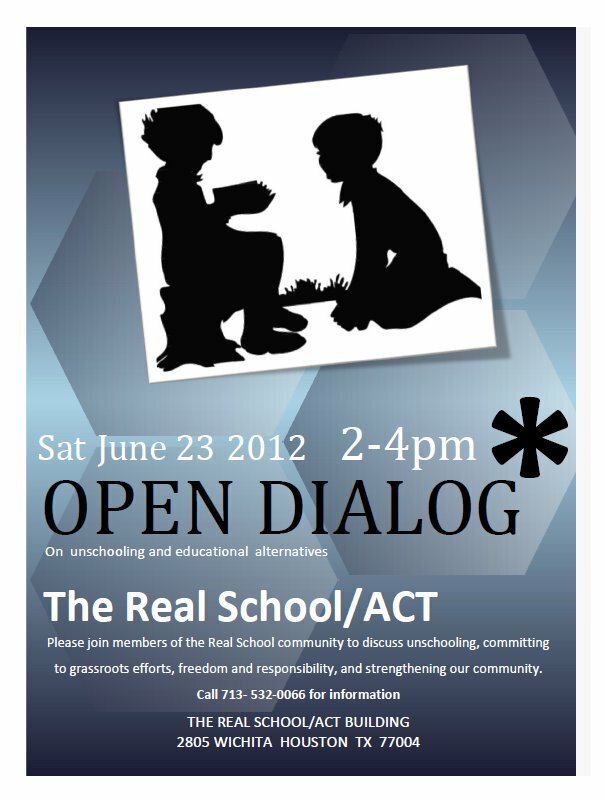 Feel free to contact me or others at The Real School Co-op with questions. We’re Building Houston’s 1st Cob Structure! Texas Natural Builders has been given permission to build the first ever cob structure in the City of Houston! We will be building a cob playhouse/meeting area for ACTnowHouston/The Real School on their property! This event will span 4 weekends!! but work will be done during the weeks as well!! We are looking for volunteers to come help build a beautiful cob structure. Volunteers will learn various natural building techniques dependent upon which portion they volunteer on. It is possible for someone to volunteer the entire build and walk away with the to build their own home confidently. FYI: on Facebook you can export events to your own calendar. We will be utilizing a great amount of repurposed and recycled materials from ReUse Warehouse and We Can Recycling. The structure will have a rubble filled trench foundation with a Urbanite stem wall, cob walls and a variation of plexiglass or safety glass and wine bottle windows, the roof will be constructed from waste lumber from various places around the Houston area, the roof itself will be reclaimed concrete Spanish style tiles and pargeting and mosaics where applicable, the interior will have cob benches and natural material shelving and cabinets if available. There is a minimum $20-$100 suggested donation with all proceeds going to ACTnowHouston/The Real School to help recoup costs. This is a great opportunity to learn natural building and an even greater opportunity for the people of Houston to see the beauty of a natural material building in is functionality and aesthetic design! Checkout the project’s progress on our facebook photo album. TRS Yard Sale – In support of Krenie! Enormous yard sale with some amazing items. Over 20 families contributing household treasures. All to benefit the spectacular pediatrician and clear-eyed activist, Krenie Stowe. Held on Saturday, April 14th, 8am to 11am at 2805 Wichita Street, Houston,TX. 77004, rain or shine. TRS will have a meeting on Wednesday, 1.18.12. Several of the potential staff applicants will also be attending the meeting. Please visit this link for more information about the staff position. It was wonderful to see so many folks, young and old (especially young) at the joint ACT/ Real School fundraiser last Saturday 11/5 at our new home, 2805 Wichita. Thanks to all who came out and donated both money and talent. The space is just about fully functional now. What a joy! We still need appliances, though, 2 refrigerators and a gas stove at least, and a dishwasher would be great, as well. We are working on buying used ones, but if anyone wants to donate any of these items, let us know. 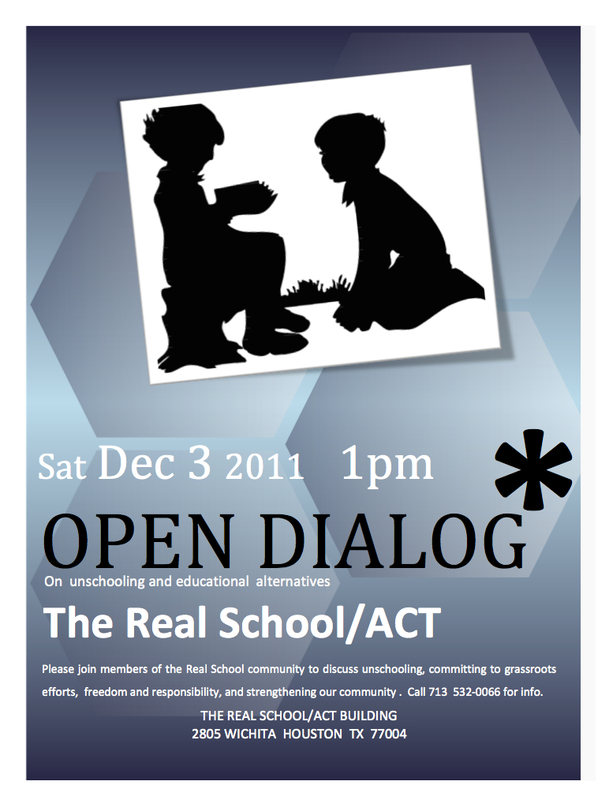 We will have an Open Dialog on Education coming up the 1st weekend in December. We will post exact date/time soon.